Tumblr is one of the many blog sites available and popular on the Internet at the moment. One of its primary uses is to allow an ease of publishing for short content that can be reblogged or passed on to others to see. The website is easily a transmedia fiction platform, as blog posts allow the formation of transmedia fiction. A big part of this is because, similar to Reddit, the commentary on posts becomes an actual part of the post, while comments on many other blog and social networking sites can easily be ignored and can have little visible impact on the original story. The combination of multiple posts creates an shared story, often using multiple mediums. If you are not familiar with tumblr, tumblogs can be devoted to a number of subjects like cosplay portfolios, webcomics, art blogs, teaching history, cataloging sexism in comics, or just reblogging things you think are cool. Numerous professionals and companies also keep tumblogs to support their products and communicate with their fans and consumers (e.g., kellysue, gailsimone, kodanshacomics). An original webcomic by Yale Stewart based on characters in the DC comics universe where all the characters are preschoolers. Since it’s not run by DC, it’s only available for free on the web. Blog posts on their own can include a number of things, including pure text, music, videos, links to other websites, GIFs, pictures, fanart, fanfiction, and commentary of some sort on any of the above. As posts are reblogged and additions are made, they become a shared story and people can add any of the above onto the post. They can respond to a text post with links or add other commentary like their own personal experiences, answers to questions, questions for other writers on the post, jokes, puns, rants on the subject or a related subject, etc. Posters often take a video and GIF it with added text for humor or find the video a screenshot is taken from and GIF it. The array of options easily allows for multiplatform storytelling. Let’s look at an example post. I will be using screenshots of the post to focus on the different parts, but to see the whole post in better detail, just go here. This is a post that has been moving around tumblr for quite some time now. 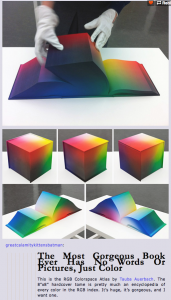 The original post is a group of pictures to show the RGB Colorspace Atlas by Tauba Auerbach, which, as the post states, “is pretty much an encyclopedia of every color in the RGB index”. The post is a mix of pictures and text, as well as a link to a related website. The author has also commented below the information with the fact that they want one. On its own, this is pretty much a simple post. When it is seen by multiple individuals and receives responses, it becomes a more expansive transmedia narrative. 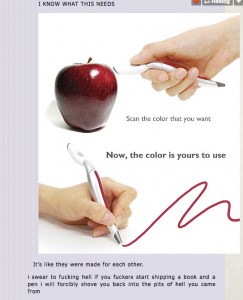 The second poster has responded with another well-reblogged post – that of the color-scanning pen. Again, it is a combined picture/text post. The way to tell when a new post has been added is to look at the gray/black lines besides the text. At the bottom of each new line is a new post, which is typically by a different person. This poster has turned the post into a story – connecting a picture/text post with another to make it longer and more detailed, as well as adding in humor. Unspoken here is the potential of the pen in the picture given the book above. The third poster (“It’s like…”) responds only with text, with more humor, bringing in more of that conversation aspect created in blog posts as they get reblogged. While tumblr has a private messaging function, people often communicate by simply reblogging things. This comment moves beyond simple commentary because it changes the tone of the narrative thus far – there’s an implied joke that these things might have some sort of fateful or romantic connection. The fourth poster (“I swear…”) is a mix of anger and humor, as well as a sort of challenge to the tumblr community. If you spend enough time on tumblr, you know that making ridiculous challenges is something the community loves. Ask them to find a video about something, and they will do it (or make it if it does not exist). 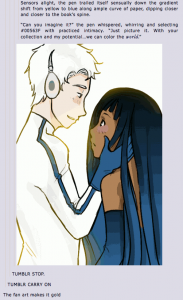 Ask them to draw something (or find existing fanart), and they will do it. Ask them to find a word for something or explain a concept, and they will do it. So this post, while it sounds rude, is par for the course. It sounds as angry as it does at least partly because tumblr is so ridiculous with finding answers and visual examples for The Ridiculous, and this will be a new level of silly for tumblr to sink to. 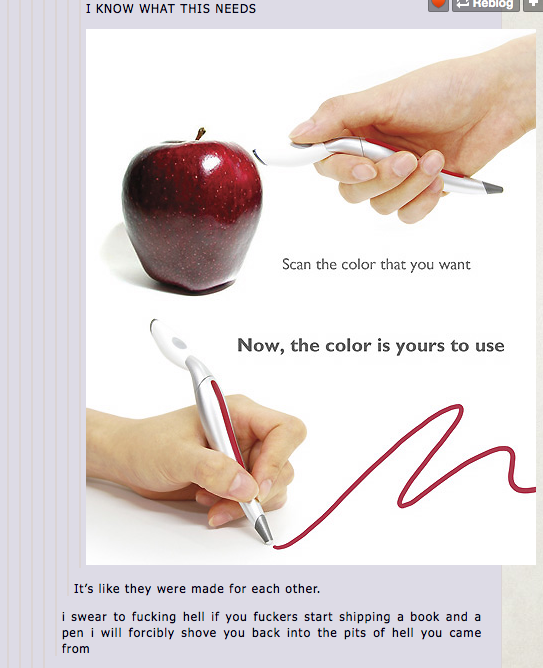 The story of the beautiful book and color-capture pen continues, now with its own drama. The fifth poster (top) is the beginning of an answer to the challenge. It is a fanfiction excerpt based on the previous posts, elaborating on the story of post. The sixth poster added on by creating a piece of GIF’d fanart (or mock-up art) for the post. Now the story has gone beyond being a simple joke. It has evolved to have humanoid visuals. Together, these individuals have created an interesting narrative using multiple mediums. The remaining posts (bottom) are commentary posts, continuing the conversation of the story. Clearly some people are making fun of the silliness to which tumblr will go, and others have no issue with the content created. Overall, it is something of a joke about creativity, fandoms, fanfiction (especially the more pornographic fanfiction), shippers (people who avidly support romantic and/or sexual pairings of individuals in some medium, whether they are real or fictional), and the meanderings of the community as a whole. Overall, this is a post that contains pictures, text commentary, a link to another website, conversations, fanfiction, fanart/original art, and a GIF – many different mediums combined in one story. 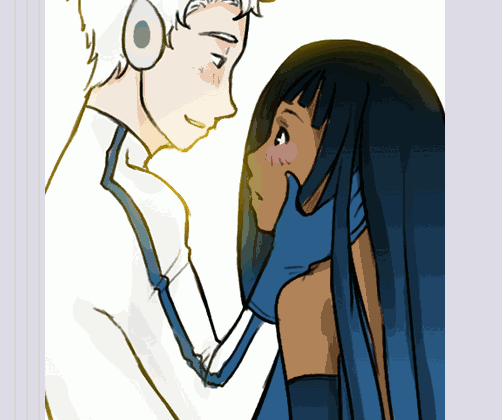 This is also clearly a story that has been seen/read by numerous people, as it has 371,873 notes. Notes on tumblr posts are created when someone likes a post (the same as Facebook’s like function, and “like” gets added on to the post in a note that says something like “murder101 likes this post”), when they reblog a post (the post appears on their blog, a note that says something like “cosplaygamers reblogged this post” is attached to the post, and any new text is added below), or when they ask a question using the post’s reply function, if replies are enabled. All continuations of the post are linked back to blogs that had the post somewhere up the train of reblogging – for instance, the original poster of this post can see all 371,875 notes, even though people reblogged it to other places. Tumblr users even reblog their own posts in response to note counts or to respond to additions to the post. It has turned into a story to be enjoyed by multiple people. Reading through it is similar to reading an article posted online or a page from a book. You observe the evolution as you move down from the top, and cringe, laugh, or however else it is you respond, and all of this further confirms the idea that this is a narrative of sorts. With the reblog function, the same post can evolve in many different ways. As posts spread, people see and reblog them from different sources, where different commentary has/has not been added. A post of lionesses attacking a lion might have a joke reply on it on one person’s blog, while it has no further commentary on another blog, and four new text replies on another. This allows for a wide range of creativity and interaction, and different stories can arise from the same content, similar to the way “Joker” protesters showed up for some of the “I Believe in Harvey Dent” rallies during the “Why So Serious” ARG. They didn’t show up everywhere and rallies had different stories and reasons for happening and their size. Responding through photographs is also very common, and forms a sort of mock skype or group conversation which often morphs into a narrative of its own. There are a number of infamous photograph posts on tumblr, such as the gunblr post and the men of tumblr fighting the patriarchy posts. The longer these posts get, the more intriguing the story told becomes, especially when you can actually see the different ways people respond to posts, and each person’s addition changes the way the story is being told – it is a shared narrative. The tagging function is another way to tell a story. Tags can provide further information on a topic – for instance, the title of a film or television show, or an artist’s name. Emotional reactions are also often posted in tags, turning the tagging function into a comment section. Tags can include ‘lol’, ‘I give up on art’, ‘I mean actiiiiiing…’, ‘so beautiful’ and so on. People can go very far with tags if you look around, and the tags should not be ignored. It is a way to find meaning where you might not have expected it. Tags are typically considered convenient ways to categorize things or find things that are related to what you are looking for. On tumblr, it becomes a new form of story-telling, and yet another medium to be used in the narrative. Overall, tumblr blogging is a good platform for transmedia fiction.